As our stay in Lifuwu, Malawi came to an end we started to relate to our next big adventure: Climbing Mt. 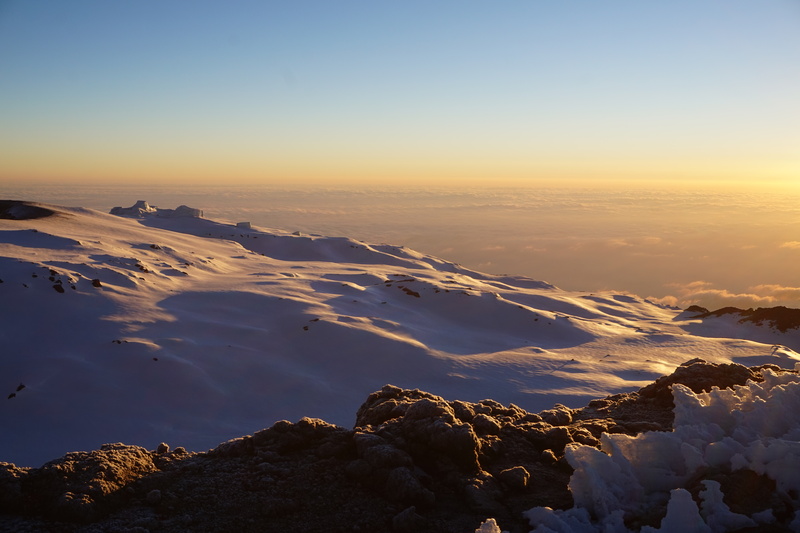 Kilimanjaro — Africa’s tallest mountain, and the tallest free standing mountain in the world. Mt. 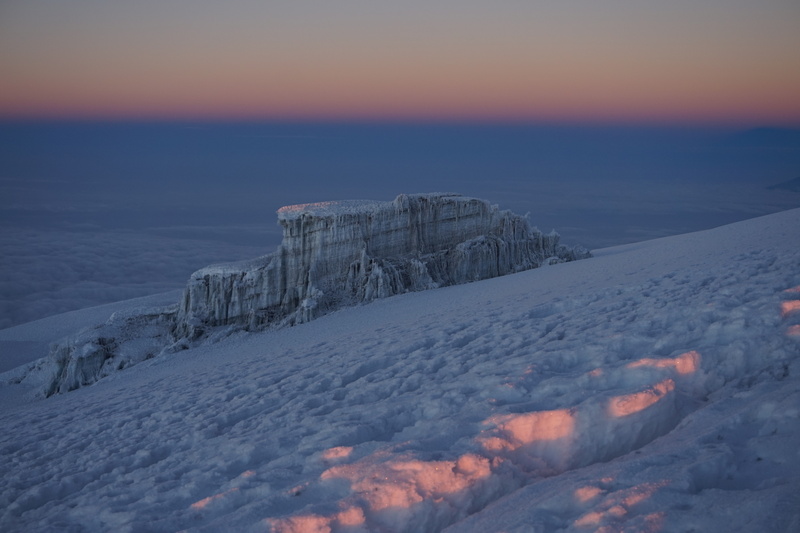 Kilimanjaro is located in Northern Tanzania — some 1200 km from Lifuwu. So the very first challenge was to get there! It took eight different vehicles and about 45 hours spread over three full days, and for the first time during our trip we truly regretted not just having booked a flight ticket 😛. 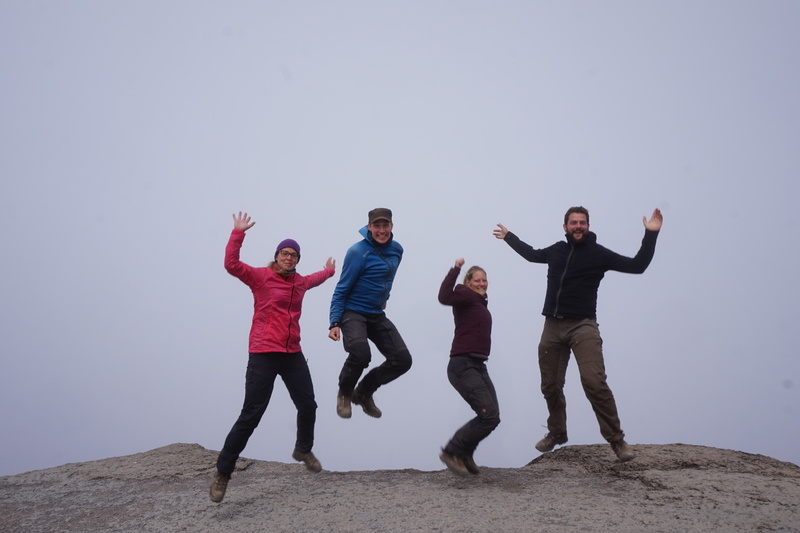 Nonetheless, we arrived in Moshi one day earlier than expected and enjoyed a full day of relaxing (and eating properly) — and best of all: We met with Tine and Frederik, our Danish friends with whom we intended to climb Mt. Kilimanjaro. It was a warmhearted reunion mixed with practicalities regarding our climb, and a beer to celebrate that we were now in the same place! 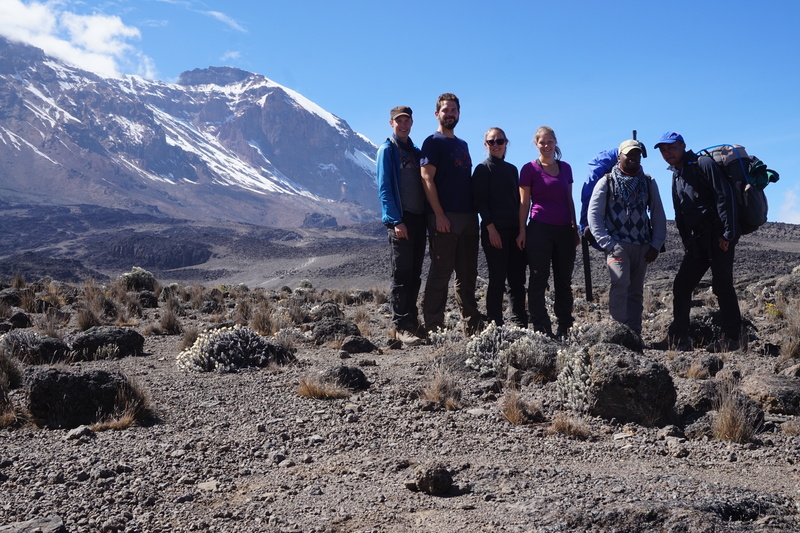 Our Kilimanjaro climb was organised with Snowcap Tanzania Tours — a local company based in Moshi. We met with them the day before our climb to sort out all the practical questions, go through our gear, and get introduced to the guide. 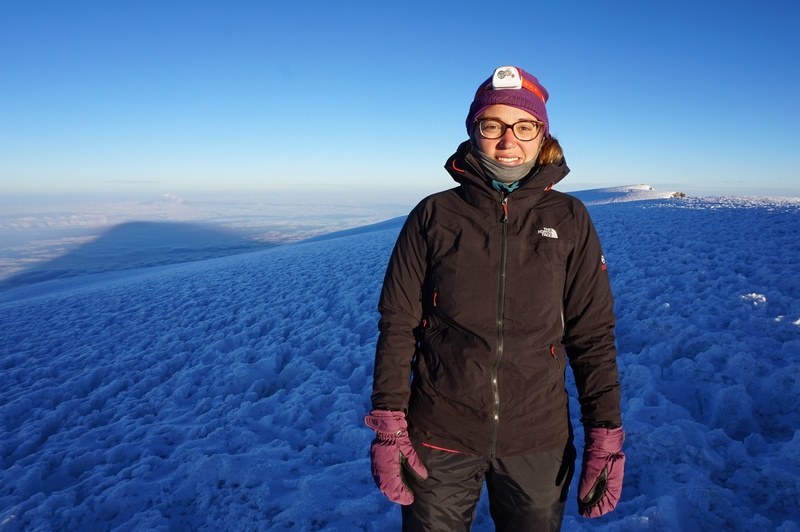 We quickly realised that most other Kili-climbers come very well prepared, and do not need to pack based on what they want to carry around the globe, but only based on how much they can fit into a huge suitcase when going to Moshi 😛. 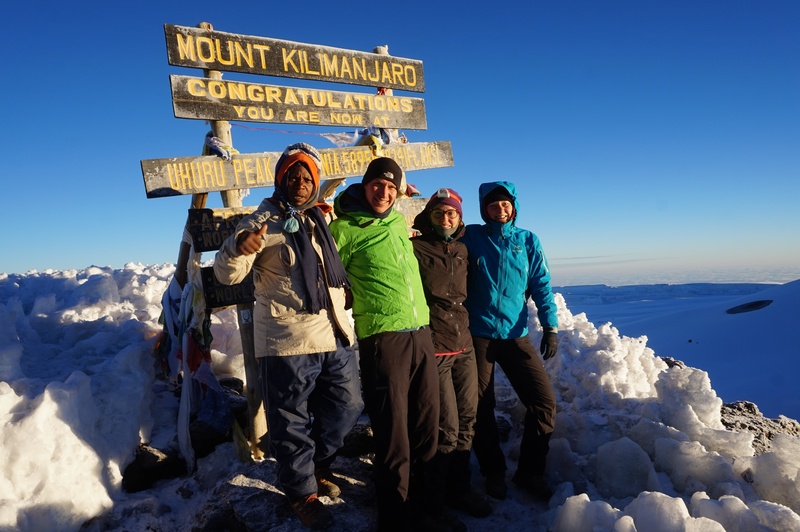 With some resistance from our head guide, Issa, we convinced him that all we really needed for seven days on the mountain was one pair of pants and two t-shirts plus our woollen underwear and our warm gear 😉. 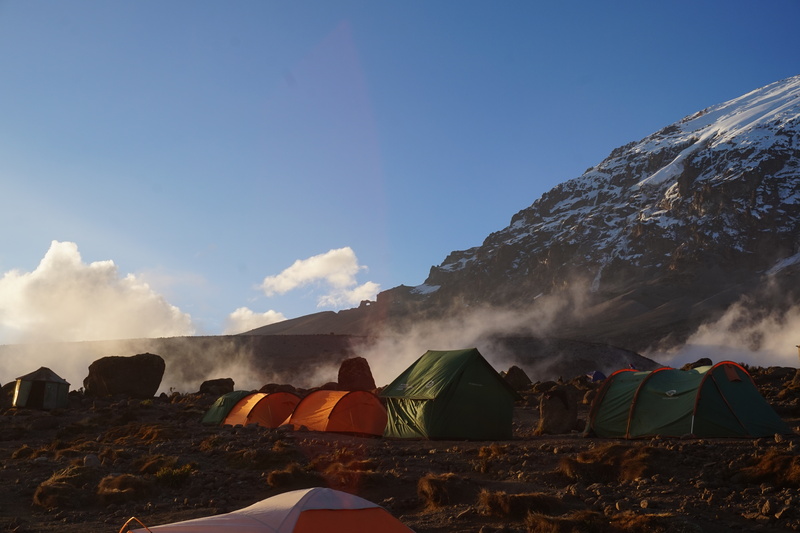 The next morning we met with the team: Our head guide Issa, assistant guide Makashi, our cook Anton, our waiter Michael, and 13 porters to carry tents, food, our gear, and all the other things needed on the mountain. We kind of new that we would have a big crew, but it is still a surprise to see how many people it takes to get you to the top of Mt. 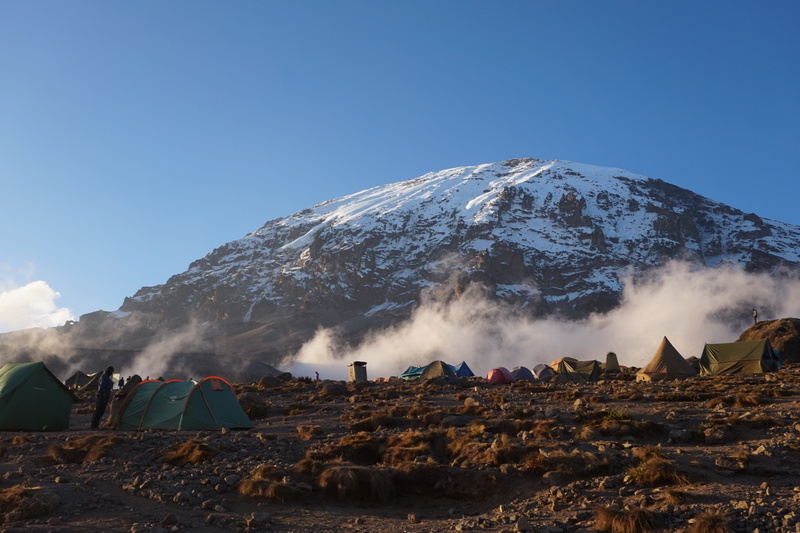 Kilimanjaro — and our crew was not even that big as we did not bring a camping toilet 😉. 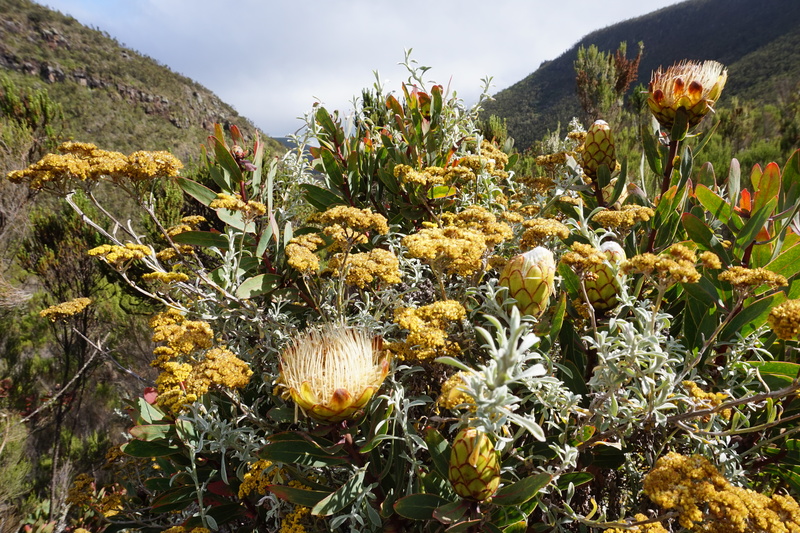 We spent the morning driving to the gate of the Lemosho route, signing in, and eating lunch. It was early afternoon before we could actually start walking. 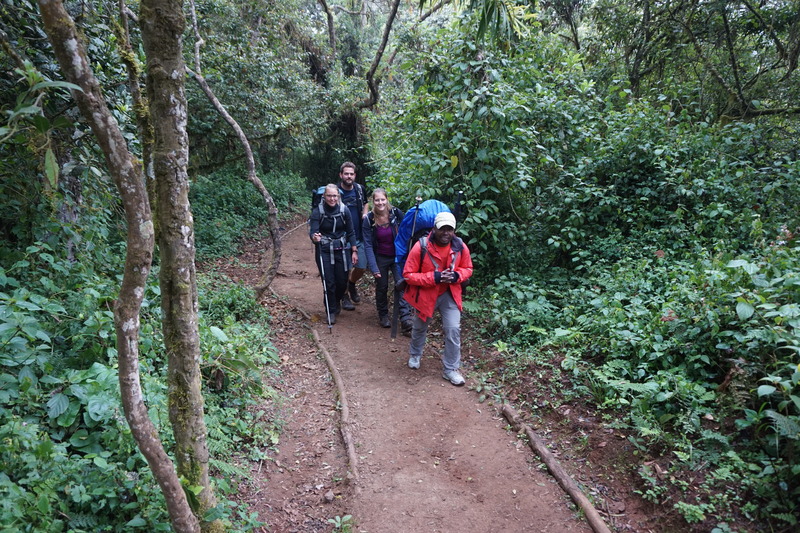 The day’s walk was only about 2.5 hours through rainforest gaining 470 altitude meters. Unfortunately, rainforest climate is not a good combination with Gitte’s asthma, and she really struggled to breathe through the full walk, even though we were still at relatively low altitude. Nonetheless we made it to Mt. Mkubwa Camp where the porters had already put up our tents. We were presented to the daily routine of having washing water delivered to the tents by the waiter, afternoon tea and popcorn served in the mess tent, and a two-course dinner before bed time. Also, every evening the guide checked our heart rate and oxygen saturation level to make sure our bodies were coping well with the altitude. We had not really expected this level of service, and felt it was a bit too much. 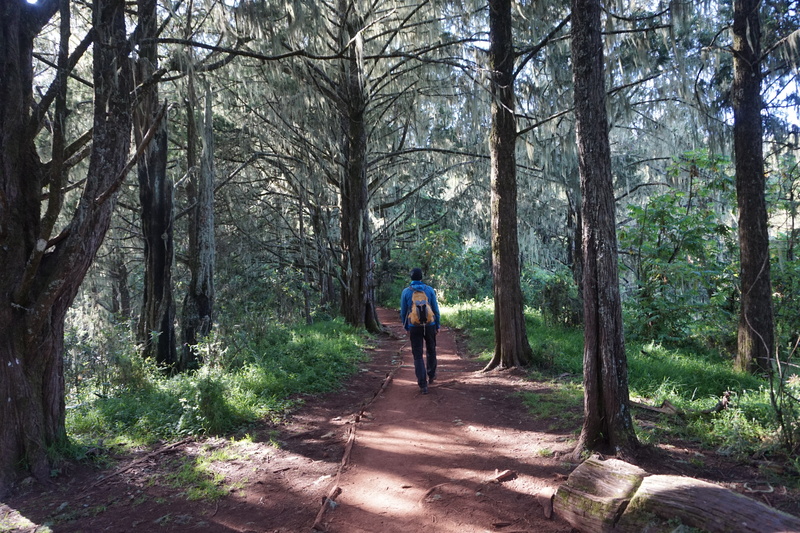 Our second day on the mountain was a long day of walking — from the rainforest and Mt. 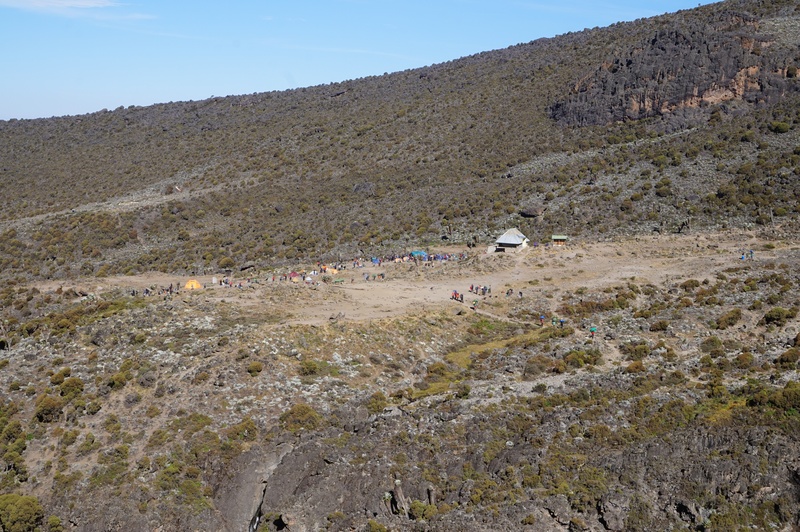 Mkubwa Camp over the Elephant Back (a very steep hill gaining 500 altitude meters) to Shira I, where the porters had set up the kitchen and the mess tent to serve us hot lunch. Again, we were surprised by how much was done to make us comfortable. 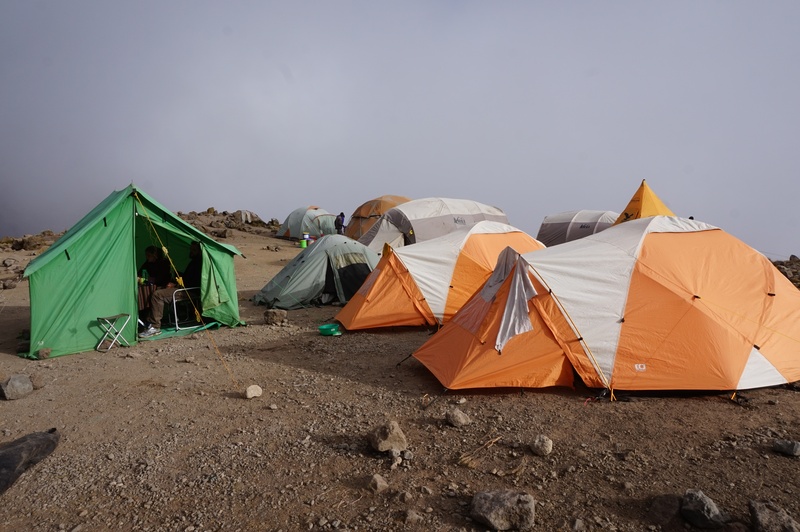 During the afternoon we continued on to Shira II (3890 m altitude), the camp for the night — and now we knew the routines! However, the guide was very much after us for not eating enough. 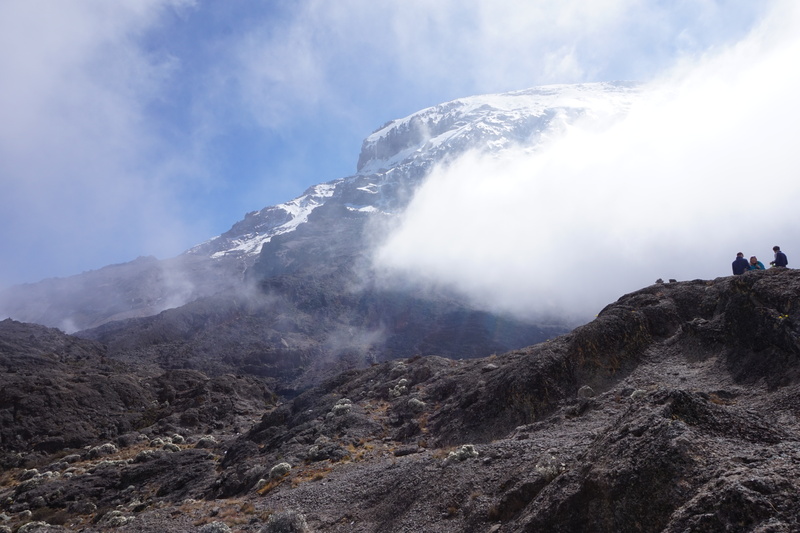 The following day was shorter, but with a steep climb to Lava Tower (4630 m altitude), to improve our acclimatisation. 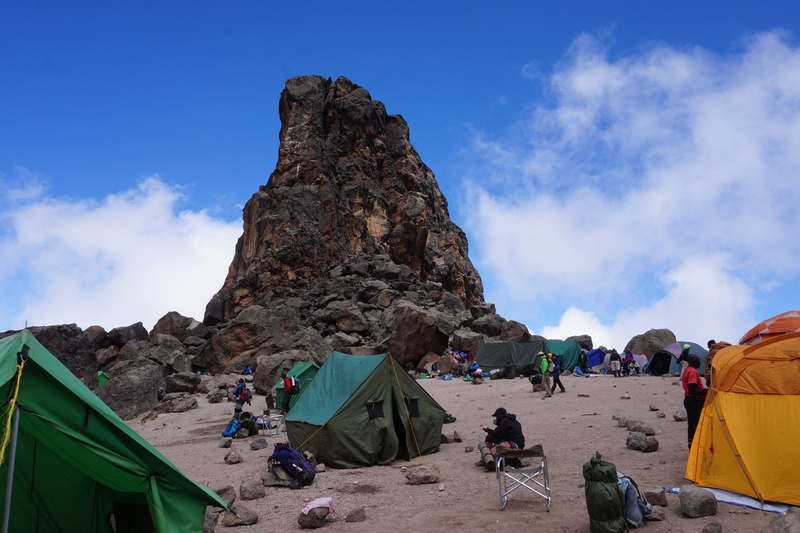 Again, the crew impressed us: They had carried the kitchen, food, and mess tent to that same altitude to serve our lunch there! 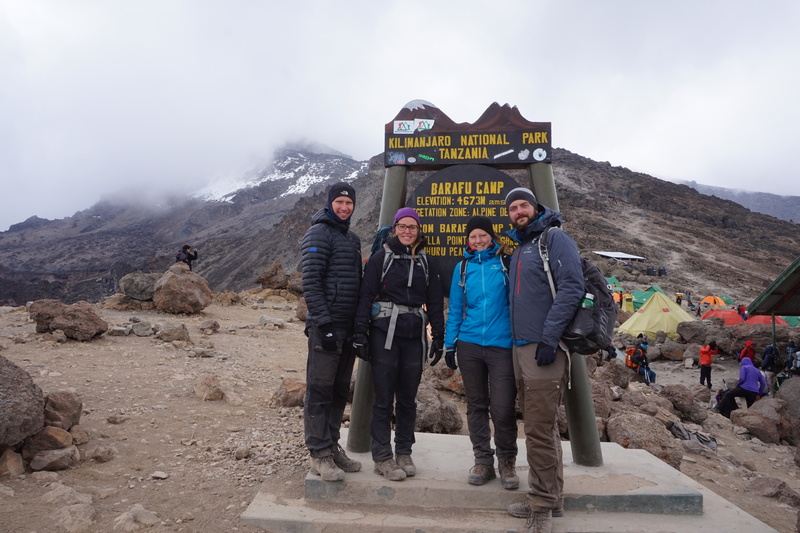 To acclimatise we were ordered to spend some time there, so we relaxed in the sun and ate lunch — and suddenly, as we should learn it always happens on Kilimanjaro, we were surrounded by a cloud and everything was misty and freezing. 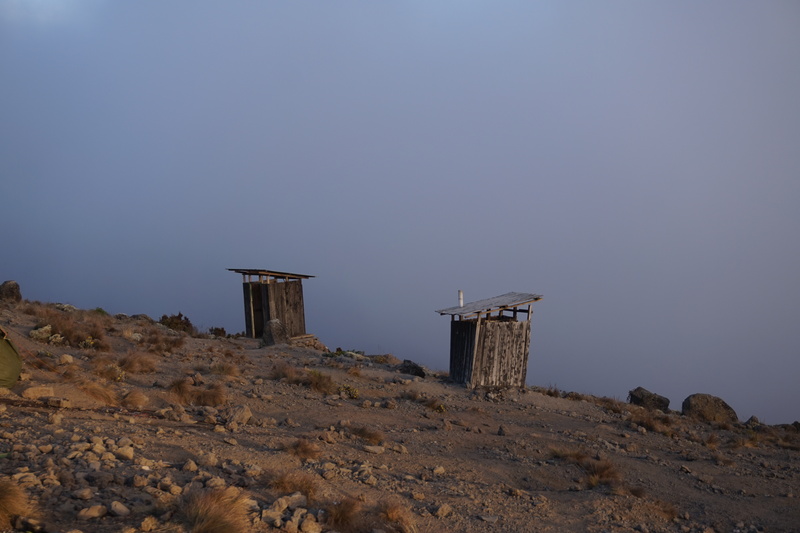 In the afternoon we walked down through the mist to the Baranco Camp (4000 m altitude), and were reminded that walking downhill can be almost as exhausting as walking uphill. 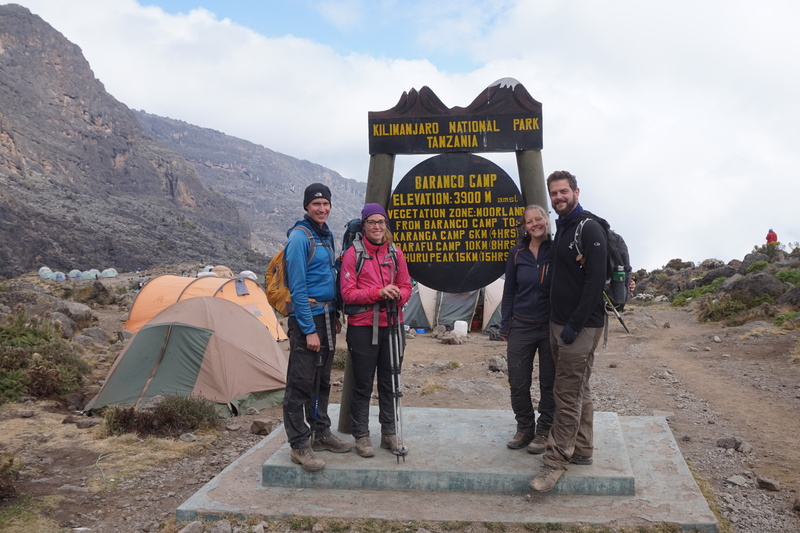 The following day was a short morning-walk from Baranco Camp to Karanga Camp. However, there was a big obstacle en route: The Breakfast Wall, a steep rocky hill that we had to climb. 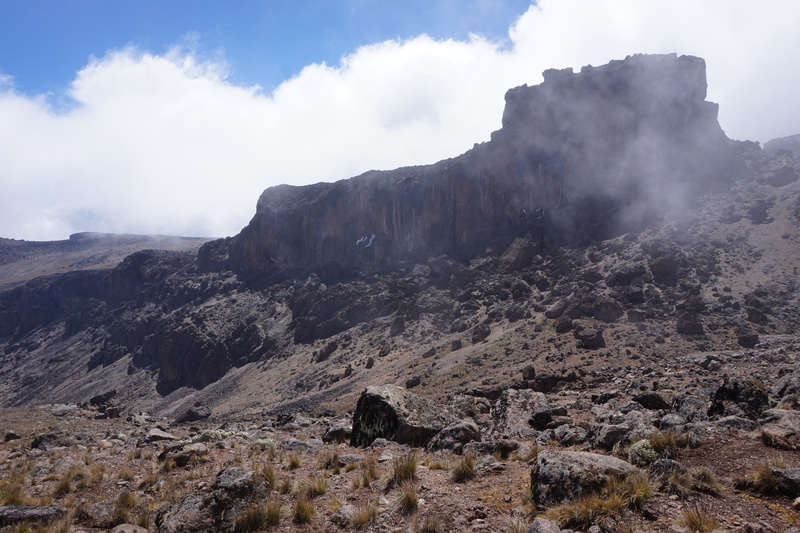 We were very happy that we all had some climbing experience, as we saw quite a few climbers struggling with fear of heights, and in general climbing up — and besides the difficulties with breathing at that altitude we had a lot of fun climbing our way to the top. Again, it got very misty, and the view from the top was very limited. 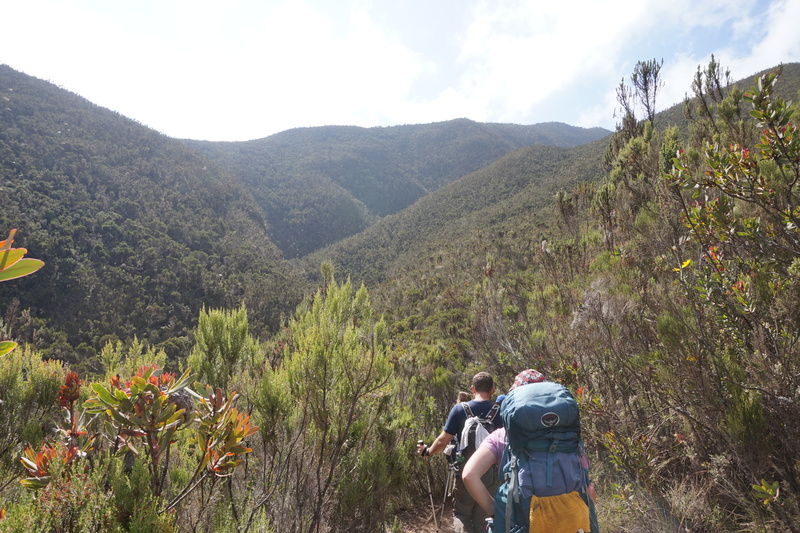 So we walked our way down across Karanga Valley with its amazing nature and arrived in camp around noon. The mist was persistent, and when we went to bed it was freezing cold, misty, and very windy. In fact, so windy that dust came in everywhere including into the tents, so we woke up with everything covered in a fine layer of dust. 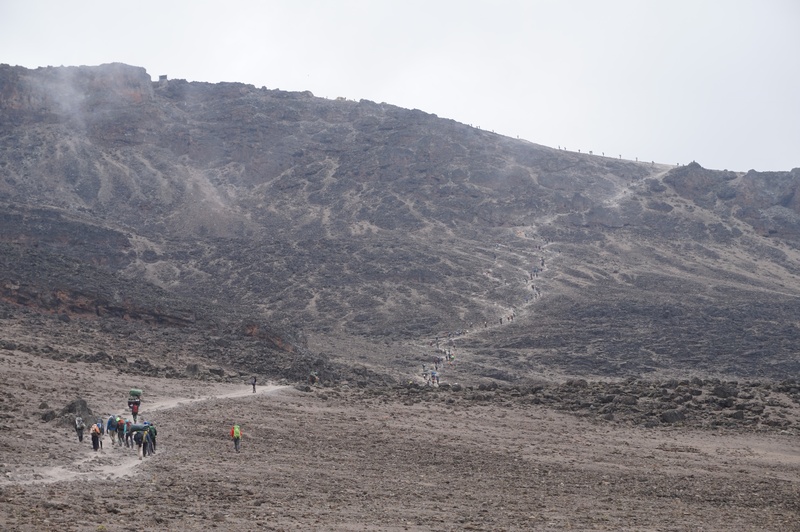 Maybe because of the dust, maybe just out of bad luck, Frederik’s beginning cold turned into a really bad one, and the following day when we walked from Karanga Camp to Barafu Camp (the basecamp for the summit attempt) he was really sick and coughing a lot. 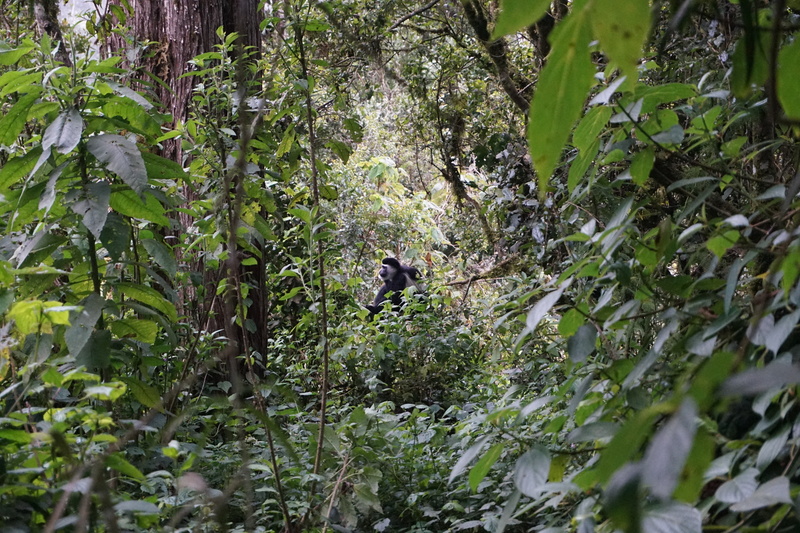 Our guides got very concerned and kept an eye on him for the full day, and kept checking his oxygen level. 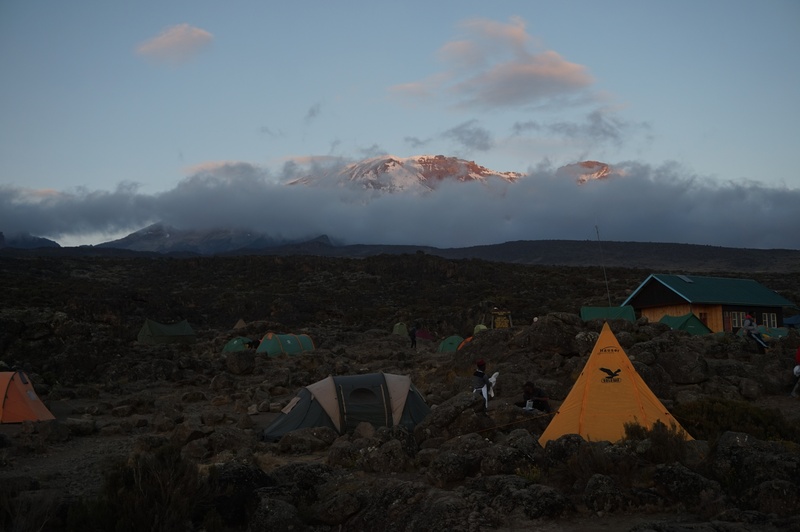 Also, the weather was quite bad with hail and wind, so our afternoon acclimatisation walk to a nearby small top was cancelled, and we were all ordered to relax in our tents before the summit attempt that same night. We got early dinner, and then went to bed to sleep a few hours before going to the top. We woke up at 11 pm to get ready, and there we learned that Frederik had been sent down just before then, as the guide had decided that he needed to be evacuated. We were very surprised, as we were so sure he just had a cold. 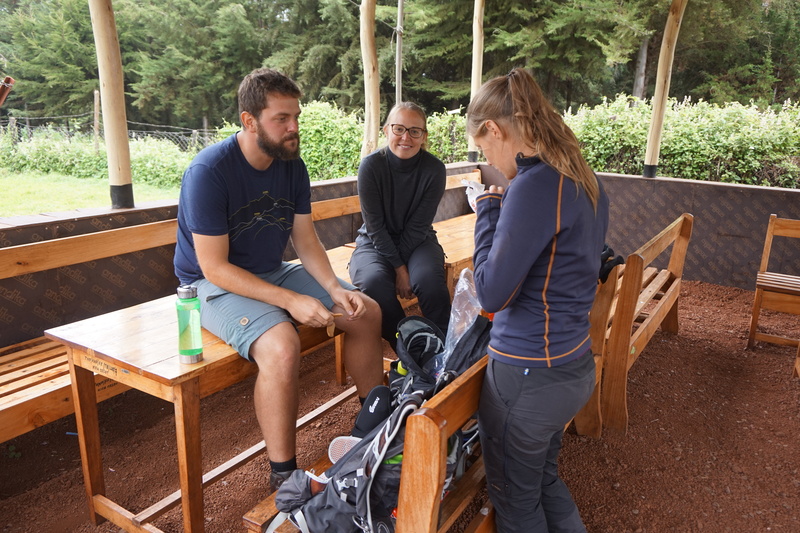 However, there were not much time to think about it, as soon Tine, Ulrik, and Gitte were on our way towards Uhuru Peak, the top of Kilimanjaro, accompanied by the head guide Issa and the waiter Michael, as our assistant guide was walking down with Frederik. It was a very beautiful night with a clear sky, a million stars, and a big moon to light up the path — and almost no wind. 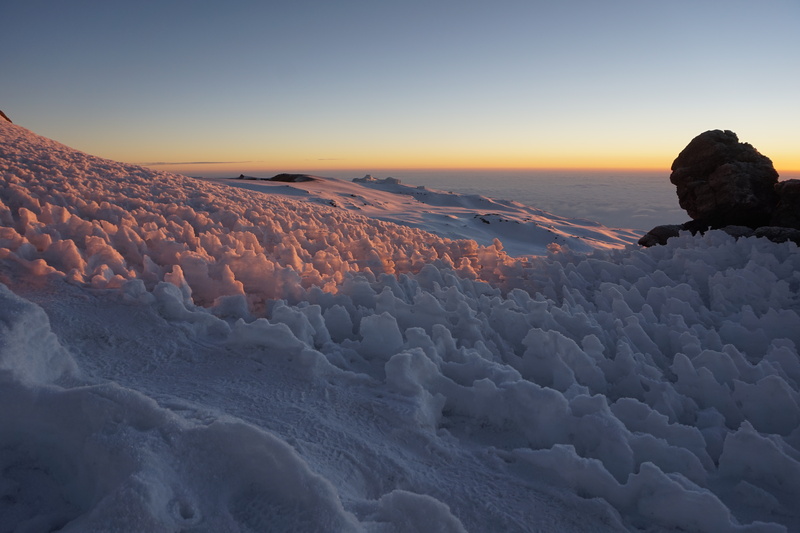 However, the coldest hours between 3 and 6 am were incredibly cold, and even wearing our best and warmest gear our fingers and toes were in a state between unbelievable pain and numb most of the time. 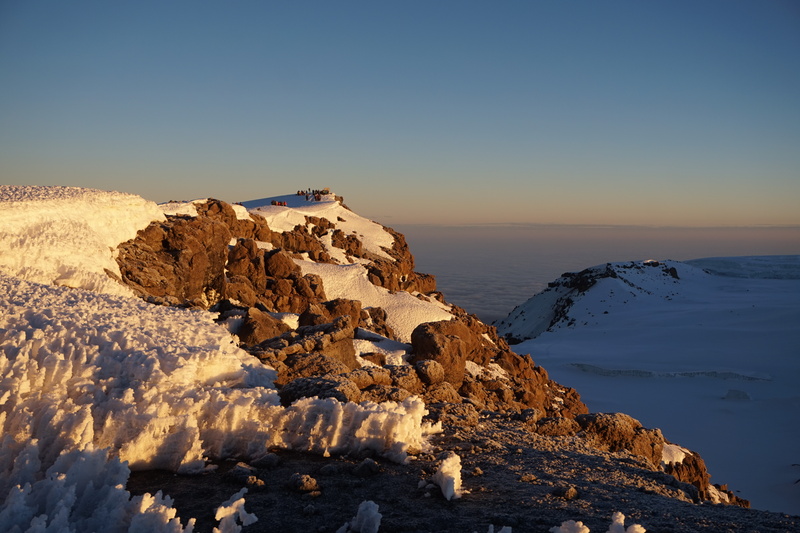 We reached Stella Point (5730 m altitude) and the crater rim just before sunrise as planned, and moved forward with a satisfactory pace, when Ulrik suddenly began stopping all the time, and walking like a drunken guy. Soon we realised that a big mistake had been made: Nobody had given Ulrik his breakfast! 😛 We started giving him chocolate and biscuits, but he was too low on sugar to really appreciate the effort and eat it. 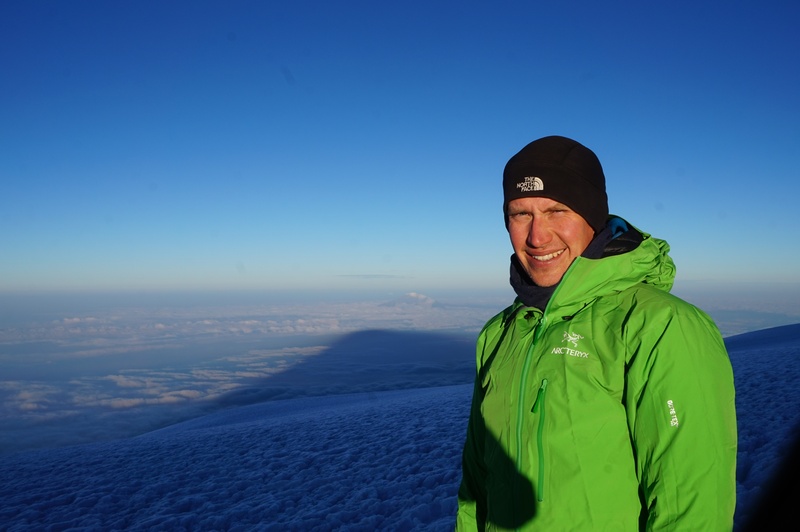 The guide and waiter quickly fixed this by pouring him a cup of water with glucose, and soon after Ulrik was almost running towards the peak taking pictures of the amazing sunrise while Tine and Gitte moved slowly behind him 😉. Mt. 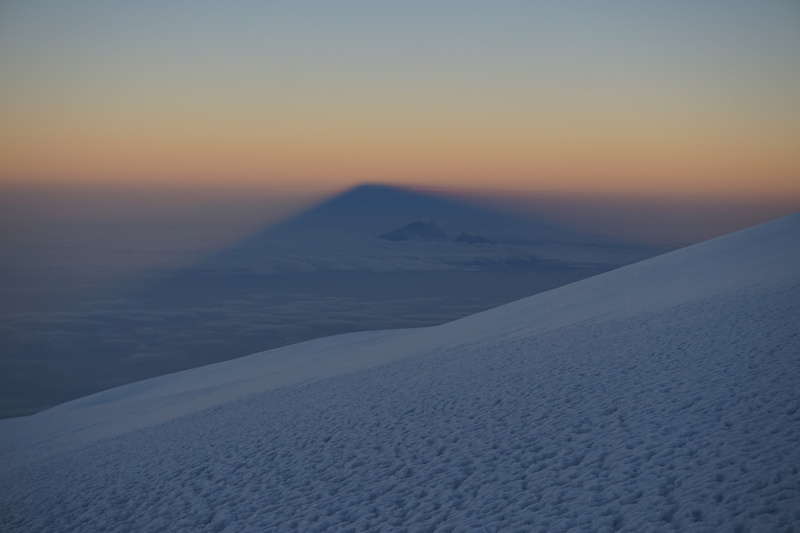 Meru in the shadow of Mt. Kilimanjaro. 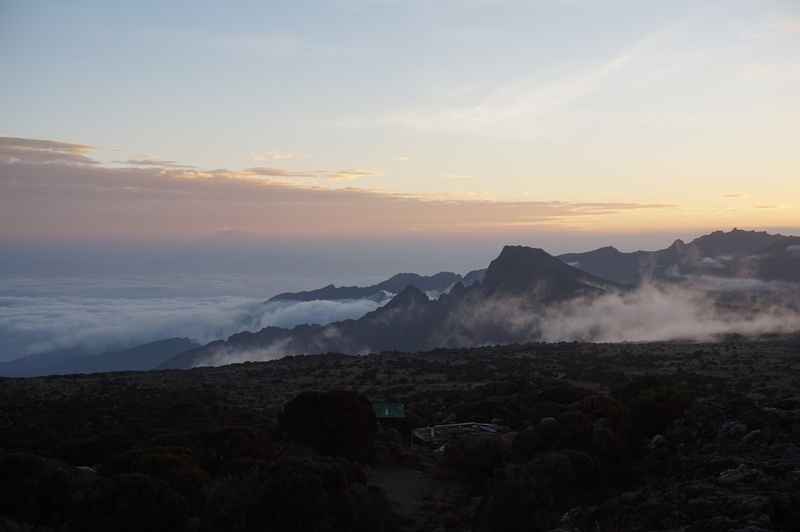 We reached Uhuru Peak, the top of Africa, 5895 altitude meters, at 6:55 am, got our pictures, and 10 minutes later we were on our way down. It was amazing to be at the top, but it was also a big anti-climax as you just turn around and have hours of downhill walking ahead of you, before you can relax and celebrate. The walk down from the top and back to basecamp took about three hours, but was almost as tough as walking up. Gitte got problems with her asthma (probably out of exhaustion), and the path was very steep. We were all incredibly tired, and probably also hungry, but could only do one thing: Keep walking. We reached the last rocky part before basecamp, and there, out of nothing we saw four familiar, and very smiling faces moving towards us. 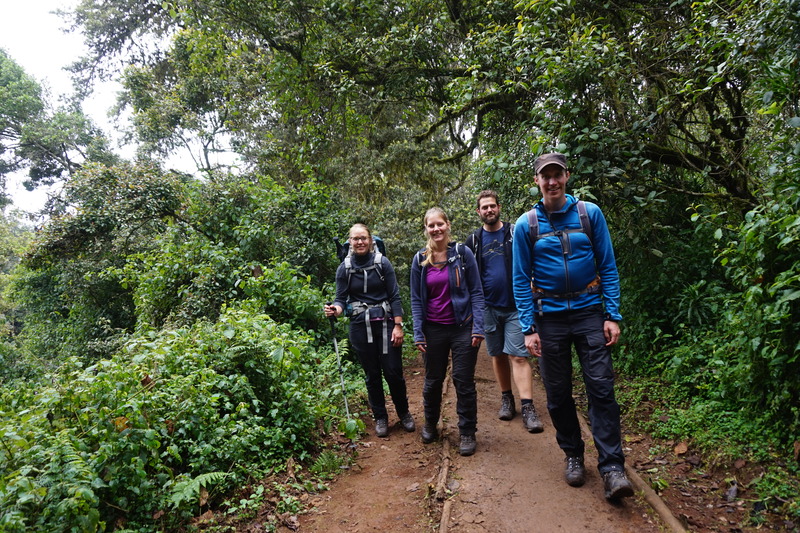 Four of our porters had made their way up the hill with congratulations and fruit juice for us! 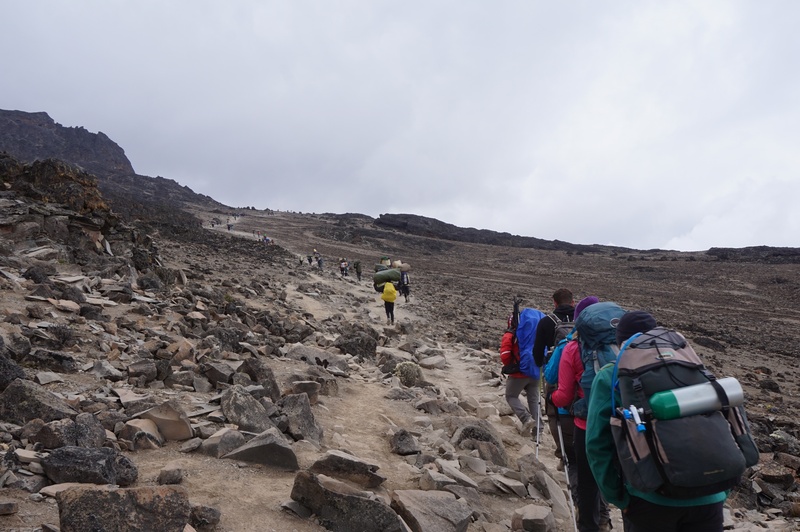 They even carried our daypacks the last kilometre back to the camp. Gitte was ready to cry! Back in basecamp we were allowed to rest in the tents aka. sleep for almost 1.5 hour, before we had to eat lunch, pack up and move on towards Mweka Camp in the rainforest, where we should spend our last night on the mountain. While we had been sleeping the weather had changed, and we moved through the different climate zones in thick mist for 3.5 hours. We really tried to walk as fast as we could, but towards the end it was not fast at all! 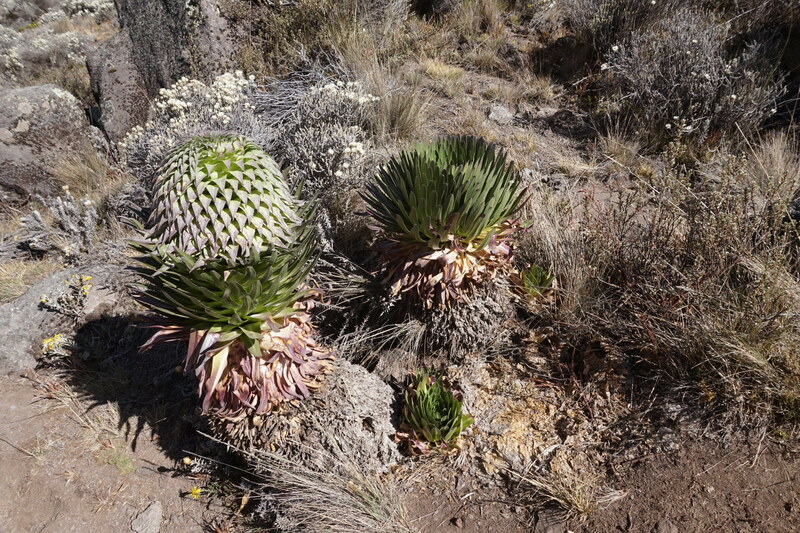 In one day we walked down from 5895 to 3080 altitude meters, and our legs were terribly exhausted. But again, four of our porters came out of the mist like angels and walked with us for the last two km carrying our day packs and ensuring us that we would soon be there. They were absolutely wonderful! The last night on the mountain we were too tired to really take advantage of the washing water, too tired to really eat dinner (or Ulrik could, of course 😉), and for sure way too tired to sort out our tip for the crew. However, we had to take care of the tip, and we spent the evening in the tent with envelopes, shillings and dollar bills trying to figure out an appropriate tip. 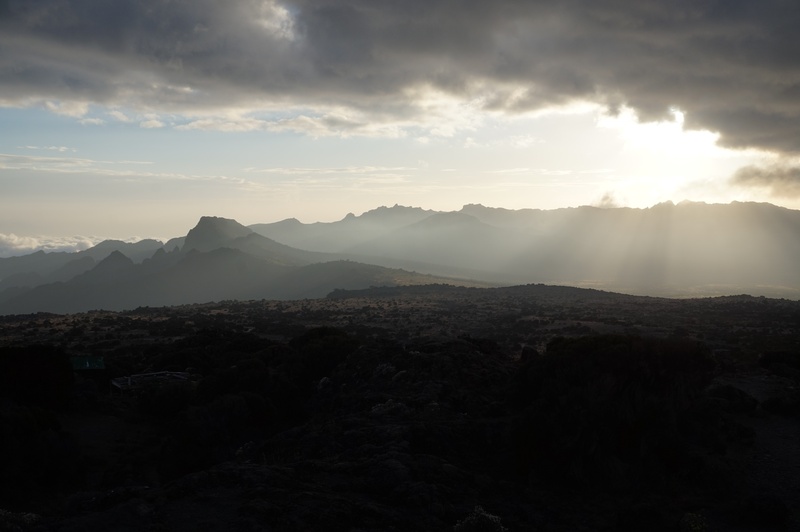 The next morning the porters celebrated us by dancing and singing — lovely guys — and soon after we ran down the mountain towards the gate: Now we really wanted to get back in town to get a hot shower and a good nights sleep in a clean and dry bed! From the gate we were driven to the company office where we met with Frederik (who still had a cold, but no signs of altitude sickness), the assistant guide, and the porters who had helped Frederik down. We got group pictures, and again the lovely crew celebrated us. And at the end of the day we got a certificate for our accomplishments 😀. Now, a few days after coming down from the mountain, it still feels surreal. If it was not for the very sore muscles it could almost just have been a dream. 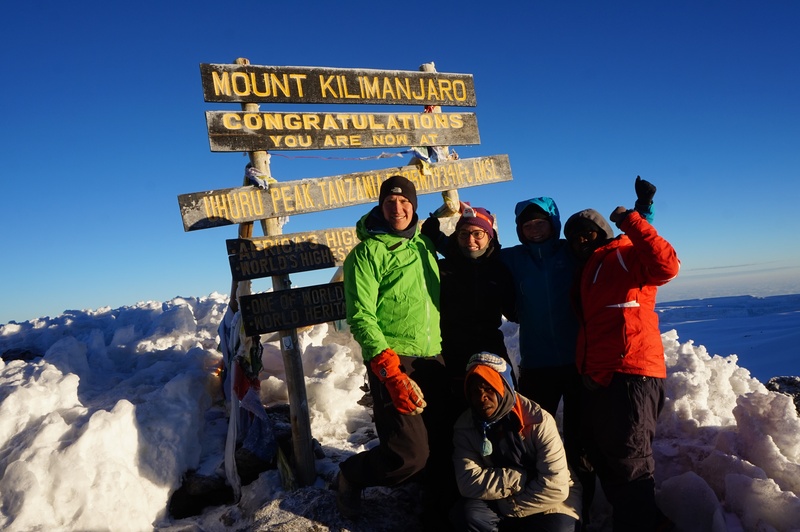 Climbing to the top of a snowy mountain in just seven days in the middle of Africa is definitely very different from trekking in the many other areas we have been to!